Invest Plus gives you a facility to manage all the details of the loans that you have borrowed ,the no. of the installments that you will be paying and other details which are important. Member Name Auto Fill. Current member come here. Loan name Select loan name here. Account No. Maximum length is allowing 15 characters. 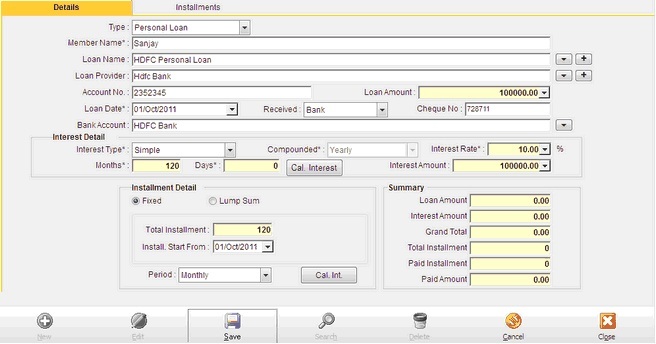 Loan Amount Enter loan amount here. Loan date (Date) Enter date here. Interest Amount Enter amount here. Installment amount: Enter amount here. Installment start from (Date): Enter starting date here. Total Installment: Enter total installment here. And also select that your installment is month, quarter, and half yearly or yearly wise. Cal. Int. Calculate interest from here. And you get focus on Installments.